One of the great things about being Catholic is that the Church has quite literally thought of everything at some point or another. Some inventive cleric even thought to include a beer blessing in the Rituale Romanum (my parish also has an annual wine blessing). Creation is good. Beer is good. Let us rejoice and be glad in it. 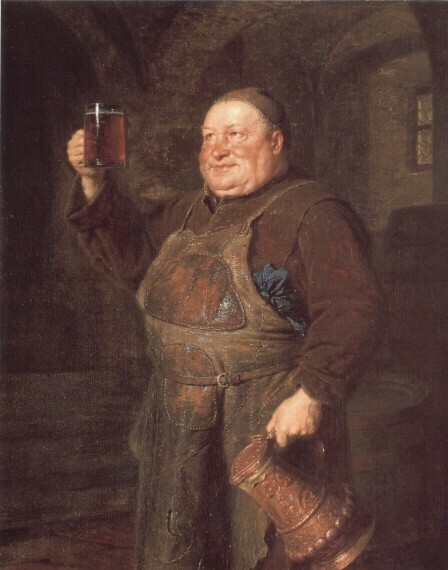 Bless, + O Lord, this creature beer, which thou hast deigned to produce from the fat of grain: that it may be a salutary remedy to the human race, and grant through the invocation of thy holy name; that, whoever shall drink it, may gain health in body and peace in soul. Through Christ our Lord. Amen. Hi Christian brothers and sisters my wife and children are catholic and I am a baptised Pentecostal christian that attends your church offend with my family and like drinking beer and praise god for your blessing on beer. I remember when the wife & I were kids at St Mary’s, we had little leather bound Bibles with the mass in it…in Latin. We had to pray & sing certain verses in Latin in those days a couple times a week in church during school hours. But this prayer is a new one. Funny that it’s similar to one I came up with for holidays where I’d serve my home brews? Get drunk but don’t take God in your mouth. I get a few visitors from this post every day. Apparently your readers like it. If you would like to use the image of the blessing from the rituale, just let me know. Would you need a priest to say this blessing, or could a layman do it? Amen, amen, amen. Amen to that everyday of my life! Beer is good. God is good. Thank God for good beer. The beer blessing?? How could I NOT re-blog this?! Just another great reason to be Catholic!